As a complement to the “Bomber Boys: Portraits from the Front” exhibit currently on display, we are excited to welcome back audio historian and broadcaster, John Jensen for another Humanities in the Harbor presentation on Thursday, May 9, 2019 at 6:00 p.m.
During World War II, the War Department realized very quickly the need for keeping the morale up of America’s fighting forces abroad. One of the most effective and beneficial ways was through the launch on May 26, 1942 of a world-wide radio network called the Armed Forces Radio Service that would beam not only the popular programs of the day heard stateside, but specially made programming aimed at appealing to our servicemen and women. Stepping forward to contribute their time and talent during that period were many of Hollywood’s biggest motion picture and radio stars such as Bob Hope, Bing Crosby, Jack Benny, Dorothy Lamour, Lucille Ball and a host of others. See and hear once again through original audio and rarely seen film clips the still powerful messaging that emerged from that dramatic time in American history. John Jensen shares rarely heard stories and anecdotes from Hollywood’s war effort, and shows examples of one of the most effective and successful forms of communications that was used to entertain, educate and inform our men and women in uniform during the war. A former San Francisco broadcaster, John Jensen has been an avid collector of music, movies, and radio broadcasts of the 1930s and 40s. Early fascination led to employment as general manager of KMPX, a radio station devoted to playing the music and radio broadcasts of those years. He produced a world-wide radio broadcast honoring the US Navy 200th Anniversary, starring Bing Crosby, Mel Blanc, and other radio stars from the 1940s. In 1992, he directed the 50th Anniversary Salute to Armed Forces Radio broadcast, heard world-wide. As an audio historian, he has provided research and assorted media to filmmakers, such as Jack Haley, Jr., Frances Ford Coppola, and George Lucas. He recently retired as senior director of public relations for World Vision. Since then he has been lecturing at various venues throughout the Puget Sound area on the Great Depression era and World War II. 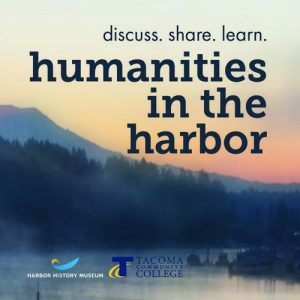 Humanities in the Harbor is held at Harbor History Museum, 4121 Harborview Drive, Gig Harbor, WA 98332. Admission is $5, but FREE for Harbor History Museum members. RSVPs are encouraged as seating is limited. Tickets may be Purchased Online or at the front desk of the Museum. Members are encouraged to RSVP as seating is limited. RSVPs and questions may be directed to Zachary Sokolik, Marketing & Events Coordinator at Harbor History Museum at marketing@harborhistorymuseum.org.